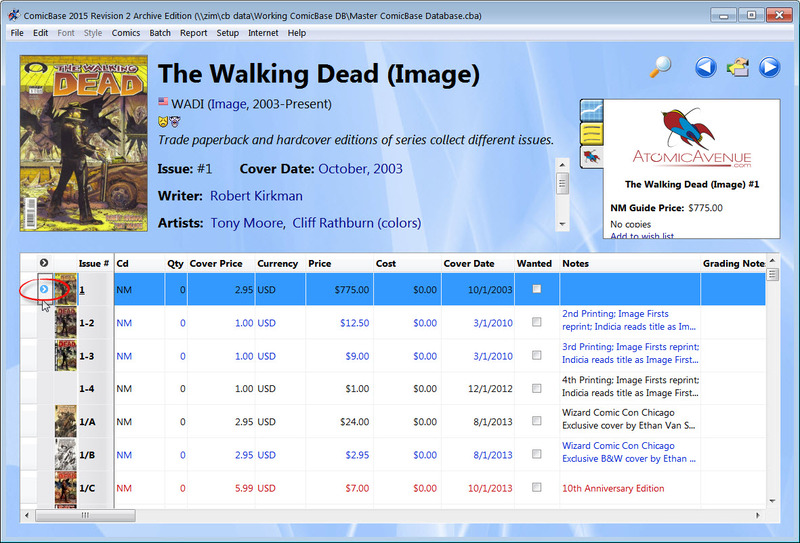 Fresh off the presses in time for Comic-Con, we've released a huge upgrade to ComicBase. 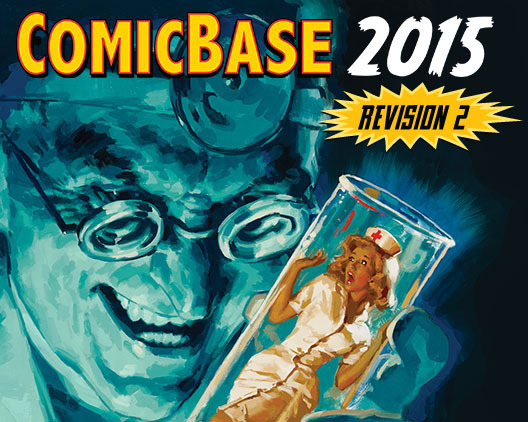 It seemed a little early to roll out the 2016 model year, so we decided to call this year's big update simply "ComicBase 2015 Revision 2". The new edition packs in over 30,000 new issues (covering a total of almost 625,000 comics), and adds a ton of new goodies, including support for both Digital Comics and Windows 10. This year's Archive Edition also comes on 3 new DVDs and adds over 40,000 new comic covers, as well as tens of thousands of updated and upsized scans. See the "What's New" page for all the new features of the new version, as well as the articles below covering what's new with Windows 10 and on using the new Digital Comics features in ComicBase. The new version is available to current users as part of the content update subscription included with your purchase of ComicBase, and can be downloaded directly from your Registrations page. If it's time to update your subscription, be sure to take advantage of the upgrade and renewals sale on now to save on the new release, and keep your collection current all year long. In a bit of a Comic-Con tradition, we're running our big ComicBase Upgrade and Renewal Sale from now through July 31. Registered users of any version of ComicBase can save on upgrades to all editions, as well as take advantage of the rare opportunity to upgrade to the $299 Archive Edition (+ a year of updates!) for as little as $99.95. Don't Forget: When you renew or upgrade your subscription, you'll get not just the latest version of the program, but also an entire year of weekly price and content updates--and any new product updates we release during that entire year...free! It's the best deal in comics--and the best thing for your collection since the plastic bag! A lot of Windows users are breathing a big sigh of relief that Microsoft has announced that it'll be shipping Windows 10 as a free upgrade to all Windows 7, 8, and 8.1 users, starting next week: July 29th. Let's face it, a lot of us were having a fair amount of difficulty getting used to the "Metro" interface that came with Windows 8, and we never knew how much we'd miss the Start menu until Microsoft took it away. Thankfully, Windows 10 seems to be a return to form for Microsoft, and we've grown quite fond of it as we conducted extensive testing on it as part of the release of ComicBase 2015 R2. The new Windows feels incredibly snappy, returns most of the familiar desktop navigation components to us (although you can customize them now with the better parts of Windows 8 if you wish), and seems like a very solid entry from the folks in Redmond. Probably the only thing we find to take issue with are some of the new desktop icons, which seem primitive when compared to their previous versions. Still, use the Windows icon at the bottom right of your Windows desktop to sign up for the new version and see for yourself, or visit the Microsoft Windows 10 Upgrade site for the full details. We had a blast at Comic-Con! Check out some of the craziness at our Comic-Con photo gallery we just posted to our Facebook page. Be sure to "Like" us while you're there to get the inside scoop on all the latest goings-on in ComicBase-land. The new ComicBase 2015 Revision 2 ("R2") manages to bring the worlds of Digital comics and physical comics together in one place, letting you see instantly what you've got in either format, and even read your Digital comics directly from within ComicBase. If you look to the left of the Picture column in your ComicBase 2015 R2 window, you'll see a new "Media" column. Just as you can drag pictures into your titles in ComicBase to have the pictures automatically linked with that title, you can now do the same thing with common digital formats for comic books, ".cbr", ".cbz", and ".pdf" files. Just make sure your digital comic files are named the same as their issue numbers (e.g., if you're dropping in the digital version of issue #12, call the associated .cbr file, "12.cbr"). If it's a variant issue, use a "-" in place of the "/", since Windows won't allow file names with slashes in them. For instance, issue #12/A would have a .cbr file called "12-A.cbr"
Once you've named your cbr, cbz, or pdf files, just drag them onto the proper title in ComicBase, and you'll see a little blue "Media" icon appear next to each issue, and the issue number will become blue and underlined. Then, just click on the issue number or media icon for an issue and the digital version of the comic will open right up in your favorite comics reader! Pro Tip: You can drop multiple digital comics onto a title at one time, and you can even rename them as you go by pressing down the "Alt" key on your keyboard. Special Secret Super-Bonus Pro Tip! Since you stuck with us so long, here's the coolest tip of them all: You can also drag ".url", and ".website" files -- web shortcuts for internet sites -- onto titles in ComicBase as well. For instance, if you've got a stash of comics from a site like Comixology where some publishers don't allow digital downloading, you can still directly link to your digital comics by dragging a shortcut from the online comic onto your desktop, where it'll make a little web shortcut file. 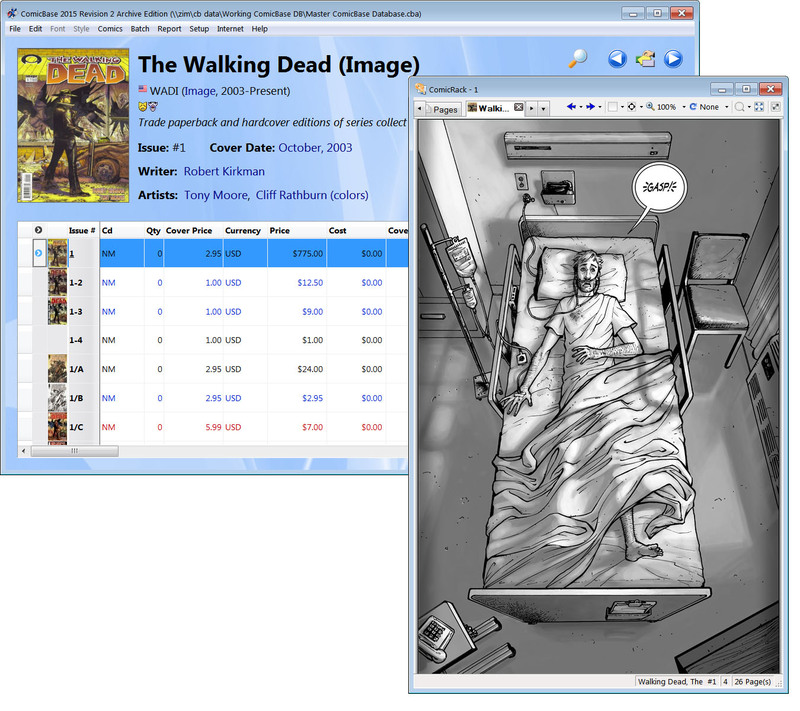 Then, just rename that shortcut to the same issue as the comic number and drag it into ComicBase. A media link will appear next to the appropriate issue, and clicking on it will take you straight to your web library!